Buy our new mobile Android for delivery service !!! 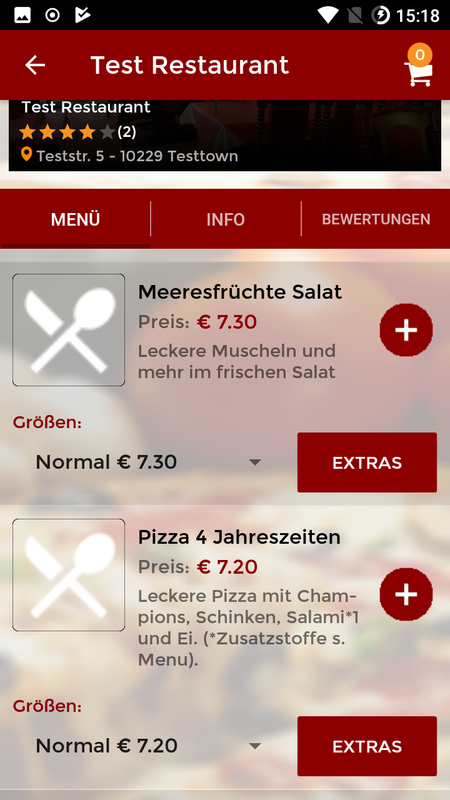 At the moment our delivery service app supports English, German and Spanish. It is no problem to add other languages. 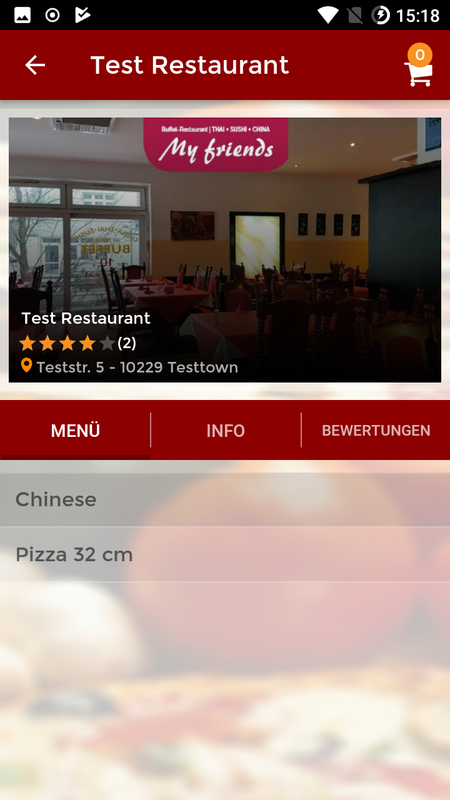 Our new app for Android smartphones is the perfect solution for any delivery service and your restaurant. You can manage all products and categories with your own admin panel on a web server / web space,. You can create, modify, and delete new products with prices and descriptions. 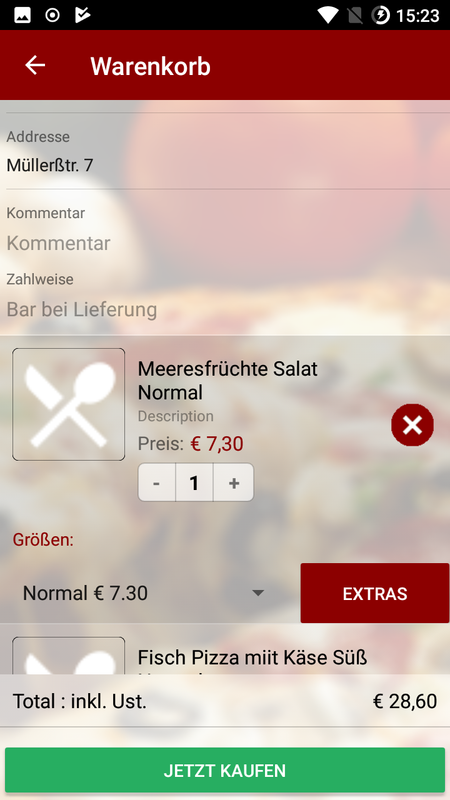 The modern design will convince your customers.For each product you can set an own picture.If there is no image to be present for the product, a standard picture will be loaded automatically by the app.Furthermore, there is an area with offers where you can inform your customers about current discounts for individual dishes. The customer can simply add individual meals in the shopping cart and then increase in the shopping basket the number of individual dishes or reduce. The customer then continues to the address and to the checkout.Here the customer has the opportunity to order via email, SMS or Whatsapp.Individual buttons can also be disabled by us. Also it is possible to calculate tax extra ! 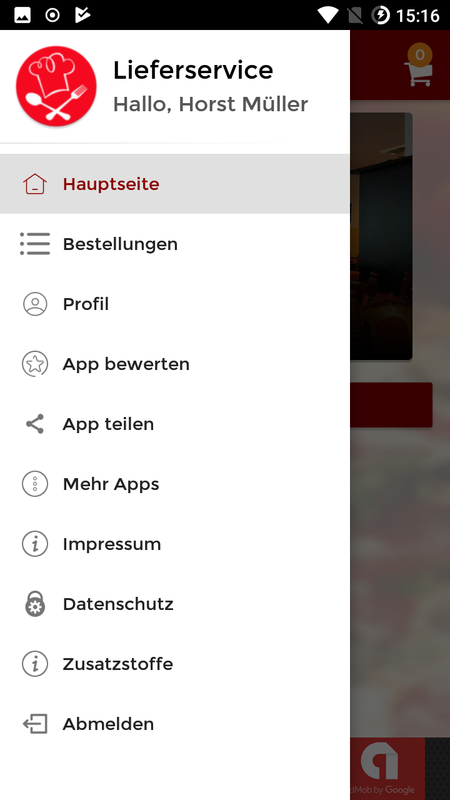 Furthermore, the app has also an „About Us“ section, where the imprint of the restaurant owner can be seen and information about ingredients in the various products. 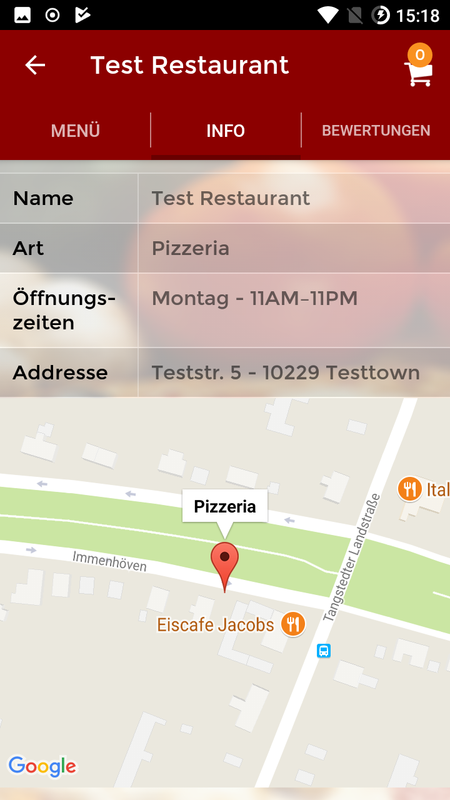 Our app is also fully „Offline“ usable without product images and renting webspace ! !Then the product data will be directly integrated in the app ! We offer a real Android app! No kit or similar with some buggy code. Manage your products with our admin panel online ! The app can also be used in „Offline“ mode without pictures. This means that all products are integrated into the app and it is not necessary to rent webspace and you have no monthly costs. Our app uses image caching. Thus, the images are loaded very quickly. 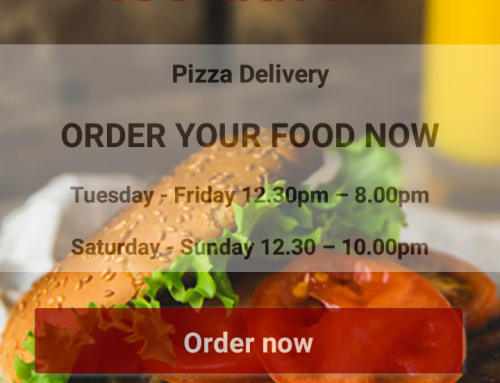 Our food delivery app currently supports over 7900+ Android Smartphones. The App has also been extensively tested to Android 5.1. Make sure that 100% of tyour turnover + tip remain yours.After about 20 orders our delivery service app has been „payed“ for you !!! 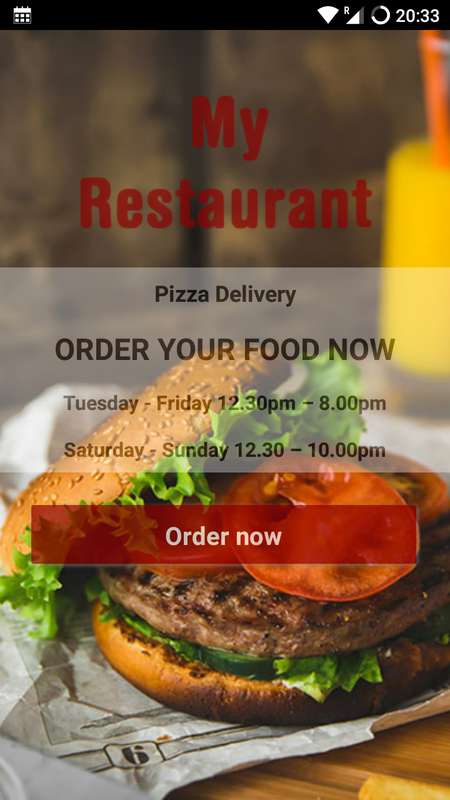 Many clients already order their food through mobile apps, and the mobile business will grow even stronger in the next few years that customers only order online ! For a demo app Simply scan the QR code to our takeaway app from the Google Play .The link to our food order APP can be found here: App Demo . Also you can in the Play Store also just search for „Compisol“, then you can find our apps. If you want to look at the admin panel for testing, please contact us and we will send you the login information. These offer are only valid for customers outside from Europe !!! You will not get any better offer for a real android app elswhere !! 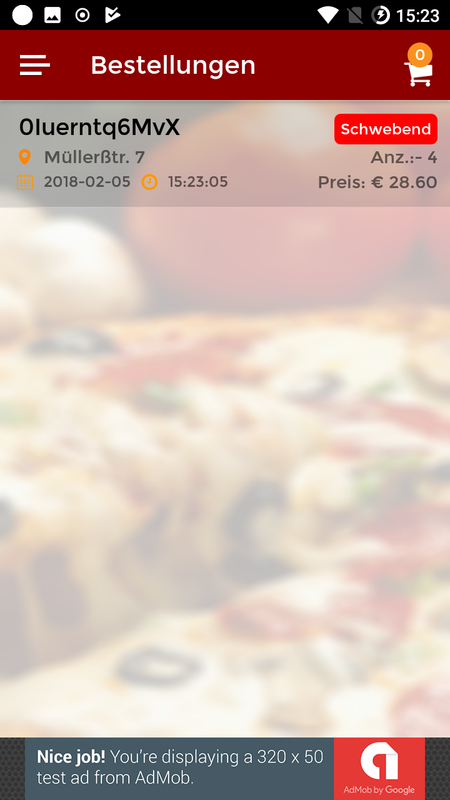 TOP OFFER: Food Delivery Service App with ads included : Only 219 $ !! Price incl. publishing the app on Google Play / Ads included . You will NOT get any better price !!! Price incl. publishing the app on Google Play / No ads included . You will NOT get any better price !!! We sell the created (compiled) App & Admin Panel and not the source code of the app! That´s why our prices are so incredibly cheap! You pay only „once“ the price for the app ! If you already have a website with webspace (PHP 5.3+ and Curl enabled), then you don´t have any additional monthly costs ! If something is unclear, please feel free to contact us! You only have to install the Admin Panel. All the work until the app is published on google play will be done by us with your server settings, if you want to use the app online. We send you the Admin Panel. You will need a webspace or web server with PHP 5.3+ and Curl must be enabled. The Android app is created by us and certified. 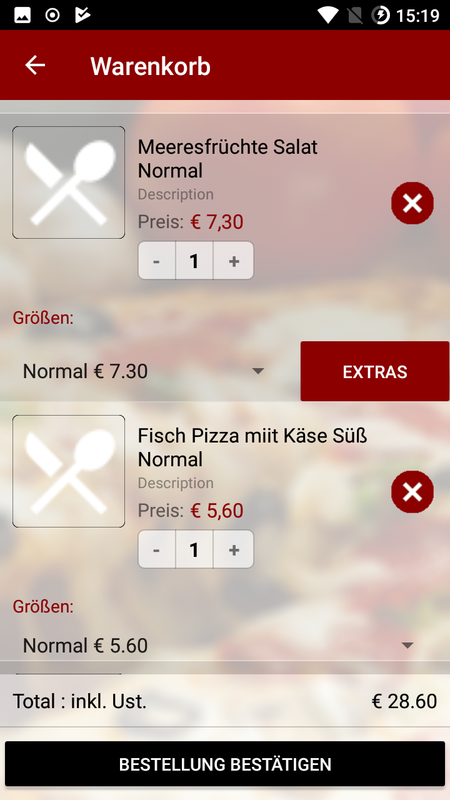 The price includes the release of the app on Google Play (with texts and previews) including changing the phone numbers, e-mail address and we create your own app icon (logo for the app) and the adjustment of colors. Data for the imprint to be entered, etc. If any important updates are necessary for the app or bug fixes, we will fix it. 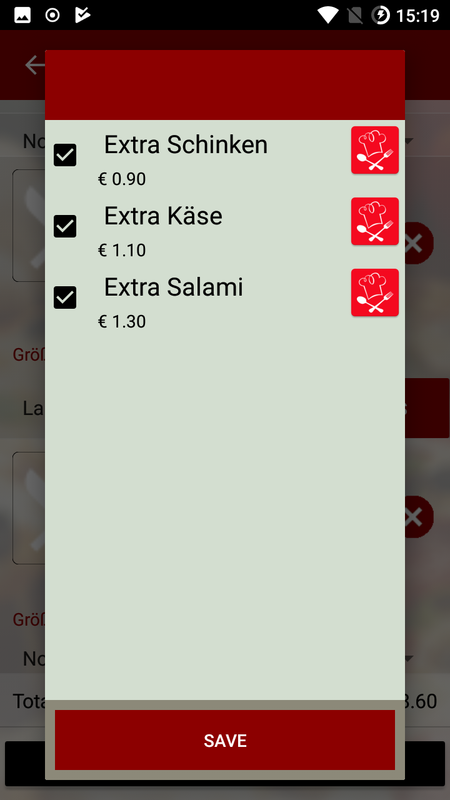 FREE EXTRA : Our SMS Manager app to manage your incoming sms orders. You can pay the app with wire transfer. Please contact us if your are interested in buying our app. Due to a lot of paypal frauds we must go this way ! Address incl. Phone number, address and tax identification number for the imprint. Mobile phone number and e-mail address where the orders are to be sent. For a change of phone number, email, or changes in the imprint we charge 35 $.The app must also be created and certified new and will be republished on Google Play as an update.These data must also be available continuously in the app. If you use the app offline and we there is any need to update the products and prices (mostly anually) we will charge 60 $ for our work.